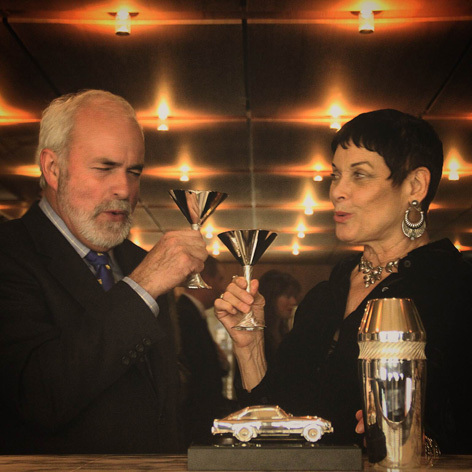 Among the guests were ex-Bond girl Martine Beswick (gypsy girl in From Russia with Love and Paula Caplan in Thunderball), Bond Lifestyle founder Remmert van Braam, 007 Magazine's Graham Rye and representatives of luxury brands including Sunseeker and Aston Martin. 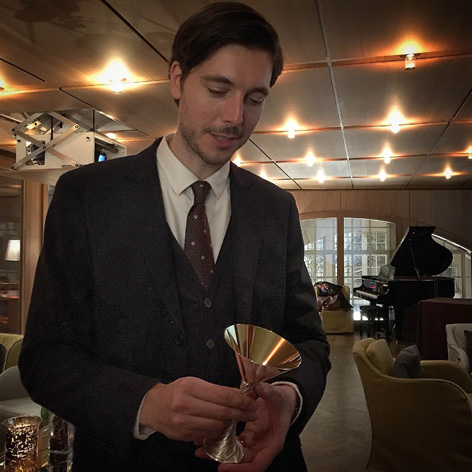 The evening, held at the renowned Hotel Café Royal on Regent Street, included a Martini Masterclass for guests. 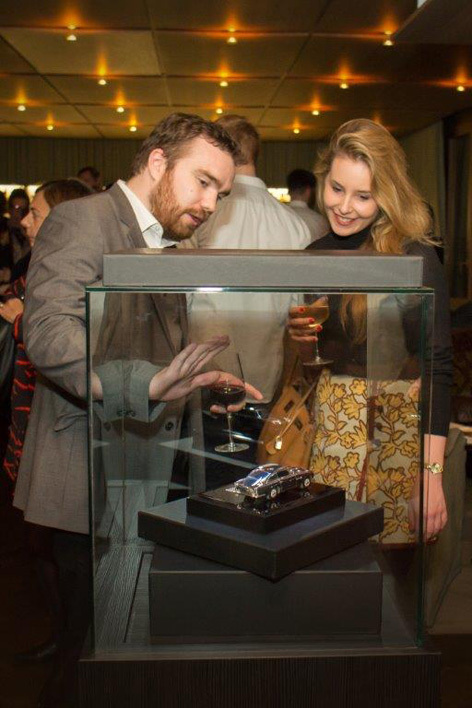 Guests met with the designers of the precise 1:30 sterling silver model of Aston Martin’s sportscar and the Martini set. 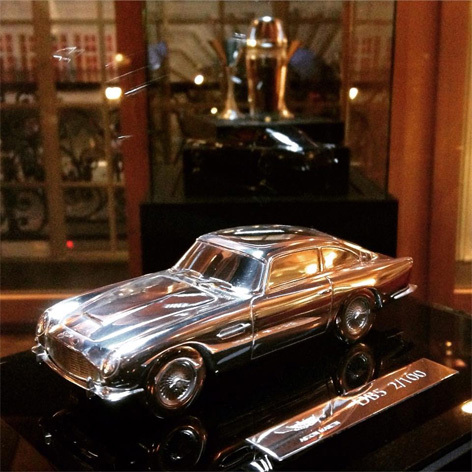 Handcrafted in London in hallmarked sterling silver and presented on a wood and glass plinth, Grant Macdonald silversmiths spend 50 hours crafting this beautiful replica of the DB5. 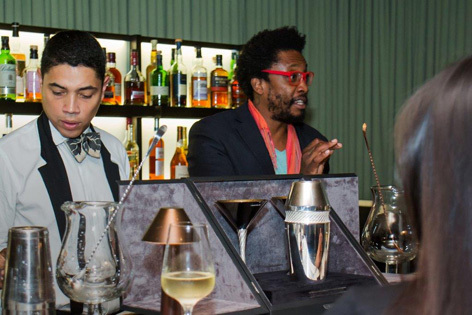 The Aston Martin Martini Set was also launched at the Timeless 100 last night and guests experienced a Martini Masterclass to celebrate. 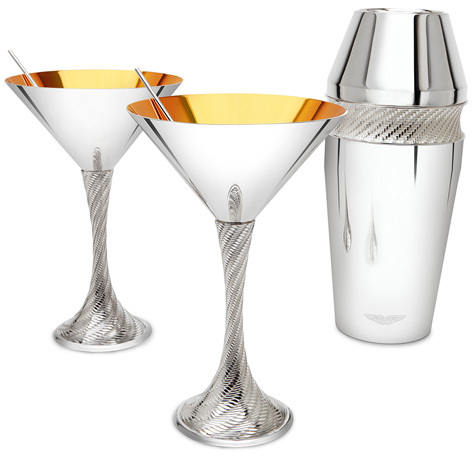 As a testament to the trademark lines and curves that has defined the Aston Martin design ethos throughout its history, this sterling silver Martini Set lined with 24 carat gold is a unique gift. 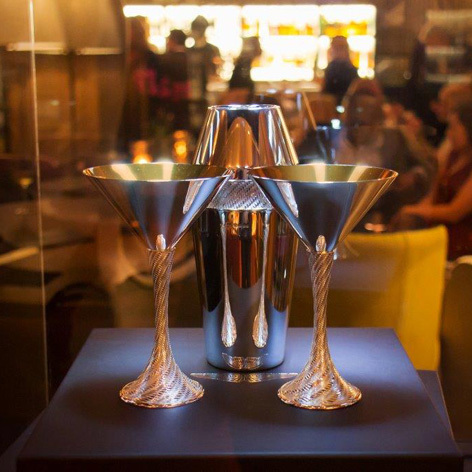 The intricate crosshatching pattern on the Martini glass stems and Cocktail Shaker replicates carbon fibre, the material used in Aston Martin’s latest sportscars. The design for the Cocktail Shaker strainer is inspired by a rifling pattern effect. Blending centuries-old silversmithing techniques with high-end modern technology, it takes master craftsman over 30 hours to handcraft each set. Both of the Timeless 100 pieces are individually engraved with the edition numbers and the Aston Martin logo. 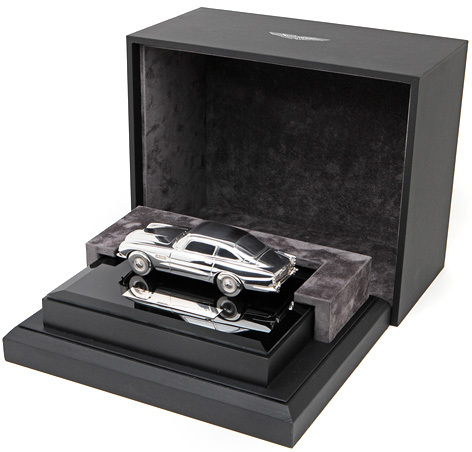 They also carry the official Aston Martin Collection hallmark as a final stamp of approval. A signed Certificate of Authenticity accompanies each piece, which are presented in a sleek black and grey case handmade by master boxmakers in England. As an Art of Living partner of Aston Martin, Grant Macdonald have worked in partnership with the British sportscar manufacturer since 2011. "Aston Martin is synonymous with pioneering style and understated coolness and the Art of Living extends this world-renowned design spirit into all spaces of lifestyle. As an Art of Living Partner, we are honoured to be welcomed into the heart of Aston Martin and to create with them a homeware collection that reflects the Power, Beauty & Soul that is built into every Aston Martin car" says Founder and Head Designer Grant Macdonald. The DB5 Model retails for £4,500 and the Martini Set £7,850. These limited edition Timeless 100 pieces are available at www.grantmacdonald.com. 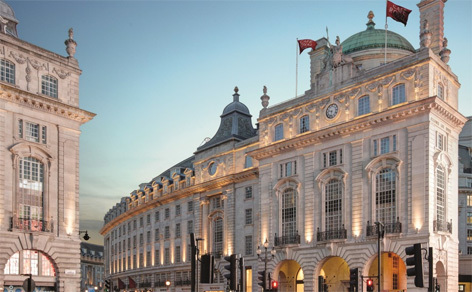 Harrods has a large selection of Grant Macdonald Aston Martin luxury items available online, including martini and champagne glasses and a luxury picnic hamper.